Late in the nineteenth century, Alphonse Bertillon, the French criminologist, anthropologist, statistician, and inventor developed a system of criminal identification that sought to classify human beings on individual standardized cards. Each card contained a pre-established set of eleven anthropometrical measurements (such as height, arm-span, length of left foot, and circumference of the skull), along with a photograph of the criminal. The Bertillon system, at least ostensibly, sought to identify recidivists. Faced with the threat of receiving stiffer sentences, repeat offenders had a great incentive to lie about their identities. In the absence of a reliable individuation technology, the state was powerless to contradict the statements of such individuals, and the Bertillon system was born of this need. More broadly, Bertillon’s system (known colloquially as “Bertillonage”) opened a new chapter in the history of the self and the exercise of state power in modernity. Via this system, the state first became capable, in a systematic and self-consciously scientific way, of harnessing recalcitrant individuals to fixed identities, permanent records of personhood and activity. Prior to Bertillon’s tenure at the prefecture of police, the French state had made haphazard efforts at creating identity records, putting on file at the prefecture tens of thousands of individual photographs of arrested criminals. This measure, however, proved ineffective. Confronted by an individual suspected of recidivism, how could one possibly compare him or her to a hundred thousand photographs? 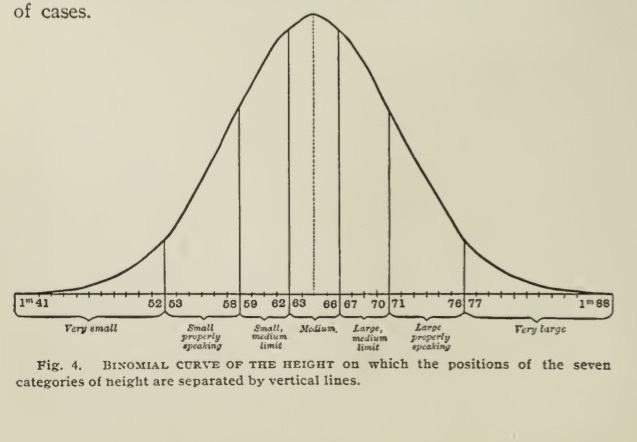 Because, Bertillon believed, the variation of the eleven individual traits he measured followed mathematical rules, one could break each measure down into seven sub-groupings of size that would encompass approximately equal numbers of cases (see Figure 2).